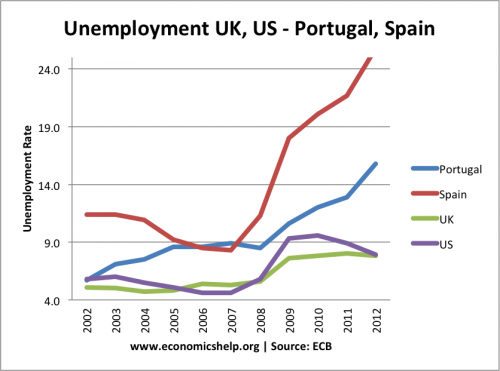 Home > Economics help blog > economics > How to Measure Success in the Eurozone? How to Measure Success in the Eurozone? Long term refinancing for banks – helping to avoid liquidity crisis in banks spilling over into sovereign debt crisis. These policies have helped see bond yield differentials narrow, and there is now more optimism the Euro will survive. However, it’s curious in the FT article on the Euro crisis FT Person of the year – Mario Draghi , that there is not a single mention of the word ‘unemployment’ or ‘recession’. Just a repetition that Mr Draghi insists austerity can work. It does leave you wondering, how exactly do European policy makers judge success? 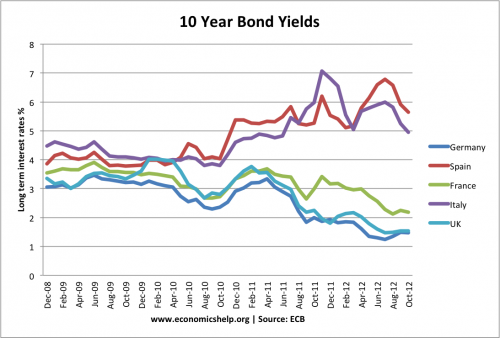 25% unemployment – don’t worry, Spanish bond yields have fallen and that must be good news. The ECB recently downgraded growth forecasts for the Eurzone, expecting growth of 0.1% in 2013. This entry was posted in economics and tagged euro crisis. Bookmark the permalink.